"Snap-apple night! ... the very best of all the sports, so far as the children were concerned, was snap-apple. It was the most spectacular and the most exciting. The snap-apple contrivance was hung by a string to the ceiling; two rosy apples were affixed, alternated with two candle ends lighted; then the affair was set revolving briskly, and the fun began. And this fun was not confined to the small folk. 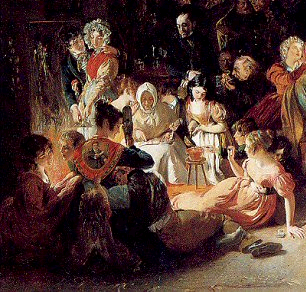 Young men and women, staid men and matrons, and even the old folks sometimes took part in the merriment. Each and every one tried to "snap" an apple. Few, very few, were successful; the candle was always treacherously close to the apple, and some of the most venturesome carried away smarting reminders of that fact. 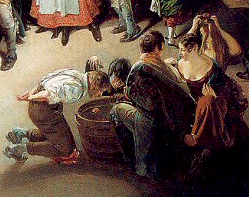 There were, besides (when the colcannon feature of the evening was passed), various games, some of which are as well known in this country as in Ireland, such as diving for silver pieces in tubs of water, or trying to capture with the mouth, unaided by the hands, apples floating in the same liquid. There was a great deal of uproarious fun in these games. They pleased the children mightily, and even the children of larger growth were not ashamed to take part in them at times. For youths and maidens sentimentally inclined there was lead to be melted and nuts to be burned to ascertain facts(?) of the future…"
"It was when the tea [served after dark] was over that the simple Halloween amusement commenced in the kitchen. From the ceiling there were suspended light wood-work crosses, some two feet across, by a string fastened in the centre, so that the cross swung horizontally. On two of the points small sockets, to hold a candle, had been fastened, and the other ends sharpened to a fine point, so that apples could be fixed by being forced on the points. Small pieces of lighted candle were placed in the sockets, and two fine, rosy-cheeked apples were placed on the alternate points. "Now then, boys, who's for snap-apple?" shouted Mr. Balderson. Half-a-dozen boys stepped forward with their jackets off and tight fitting "bishops," as the pinafores were called, over them. A gentle circular motion was given to the cross. Snap, went one of the boys at the biggest apple with a view of biting, and ere he could catch it, one of the lighted candles came full into his half-opened mouth, amid the laughter of the bystanders. "Never mind, Jock," shouted Mr. Balderson. "Now, Willie, lad," said he, encouragingly, to a smaller boy who cautiously tried on the other; bob went the apple, and Willie ducked his head when the candle came round. Another lad tried, and again failed. Jock, as he was called, and Willie kept the fun up by repeated attempts to secure the apples. It was laughable to see the boys with their hands tied by their side darting again and again at the swinging rotary apples, until a loud shout proclaimed that Willie had secured the first prize. By a little practice and a small amount of caution, it was found possible to seize the apples without getting burnt, or obtaining tallow instead of fruit." I'd always wondered where the custom of bobbing for apples came from. Thanks for posting this.